computers, programming, startups and life. 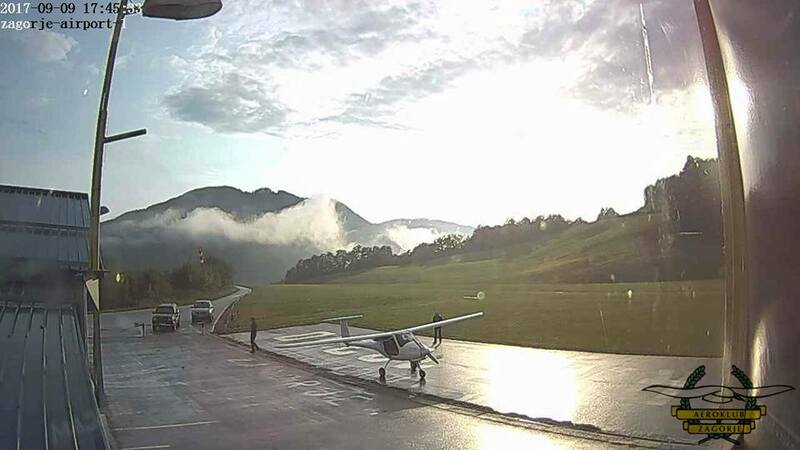 In this post I describe how I set up weather station, live camera feed and liveatc.net audio feed for our little airstrip. 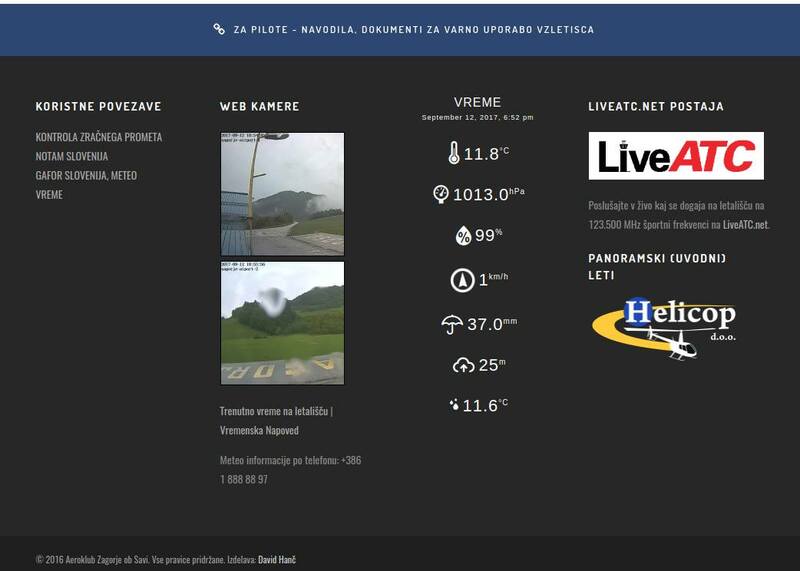 Real-time camera feed and weather information displayed on the club website. A while back I moved from Ljubljana to a small town around 30 km East of Ljubljana. Before I moved here, I used to fly small single engine planes (for fun) out of Ljubljana Airport and Portoroz Airport. This means that both of those two airports are now too far to regularly fly out of them. With no traffic, it would take around 1 hour to get to Ljubljana Airport and around 2 hours to get to Portoroz Airport. Those two hours can easily turn into 3 hours during peak summer time when highway is full of holiday travelers (done that once, have no plans to repeat it). Regular flying is very important to stay current and be a safe pilot so I needed to find a new airport which is closer by. 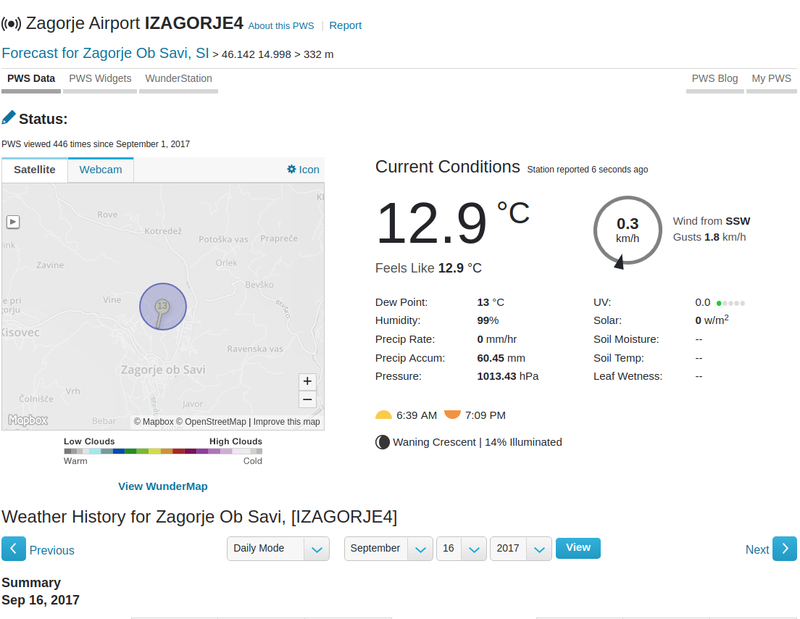 Luckily there are two airports in the 30 minutes driving distance - Airport Zagorje ob Savi1 and Airport Sentvid Pri Sticni. Zagorje ob Savi Airport (Vzletisce Ruardi). 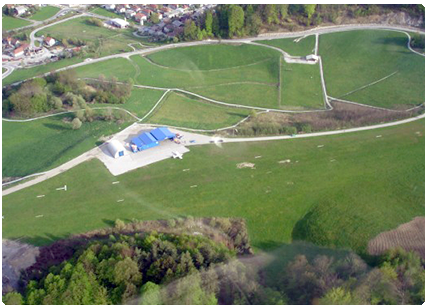 Both of themare small, un-towered general aviation airports with a relatively short grass runway. For some reason, I decided to visit Zagorje ob Savi Airport and club first. There I met a bunch of dedicated, friendly and welcoming people. They were the main reason I decided to make this my new “home airport”. Both of the airports I used to fly from, were bigger towered international airports (for Slovenian standard, but in global scheme of things, they are still really small and low traffic airports). Compared to those airports, this small airport also feels a lot more casual, social and homey2. In this post you can learn a little about our setup - notably our weather station, web camera feed and LiveATC audio feed. To be able to add some technological improvements to the airport, we first needed an internet connection. Sadly there is no fixed internet connection at the airport, but there is good 3G / 4G coverage so I decided to re-purpose one of my old Android phones to act as an access point. I purchased a local prepaid plan with 50 GB monthly data cap and utilized tethering functionality on an Android phone. So far, the whole setup has been online for almost a month and we haven’t encountered any issues yet. Based on the data usage calculations I did4, 50 GB should also be plenty. Because the devices are behind NAT and all the incoming connections and ports are blocked, I set up an SSH tunnel and port forwarding from a Rasperry Pi which is behind NAT to an outside cloud-server to which I have access. This way I can tweak and change various settings, without needing to be physically present at the airfield. Weather is one of the most important factors for flying (especially for small single engine planes in VFR conditions) so getting a weather station was the first thing I did. It’s also worth noting that the airfield already had a wind sock before. 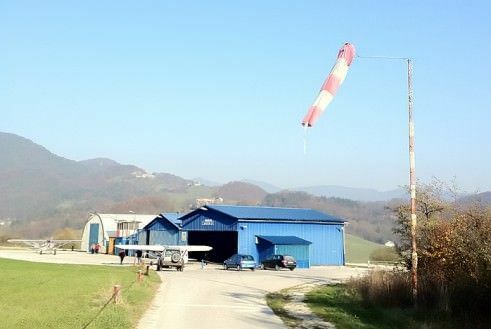 Since wind is a very important factor in flying, windsock is one of the many mandatory things a place needs to be officially classified as an airfield or an airport. I did some research and I decided to purchase a Fine Offset WH2900 weather station. Here is a list of minimum featuresthat a weather station needs to have for me to consider the purchase. Fine Offset WH2900 weather station, sold under various different brands and names. 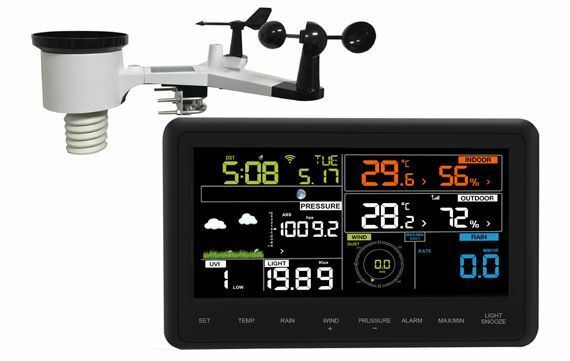 This weather station offered all these features and based on the specifications and reviews I read online, it offered the best price / performance ratio in this range (there is of course no upper limit for the price and you could easily spend more than 1000$ for a more professional weather station). It’s also worth noting that Fine Offset is a Chinese OEM and I purchased the station from a German company on Amazon under a different name (there are many companies which sell those weather stations under their own brand). Luckily, the tower at the airport already had an antenna pole on which we could install the station. The location of the weather station is one of the most important factors if you want accurate data. Trees, houses and other obstacles in the proximity can all affect the readings. The pole itself offered a good location, because it’s quite high (around 6 meters) and relatively far from things which could affect the readings. The setup itself was simple, because the weather station only needs to be connected to the wireless access point and configured to send data to Weather Underground. Sending data directly to WU is good because it’s easy to set up, but it also means you are locked-in to an online service and there is no official way for the weather station to send data to your personal server or directly grab data from it. As a big open-source proponent and believer that everyone should have access to their own data, this was especially a big downside for me. This and lack of security are also one of the main reasons why I’m so skeptical and worried about the whole IoT movement. Luckily, there is a great open-source project called weewx out there which allows you to fetch data from the station. This project retrieves data from the weather station by sniffing and reverse engineering the network traffic sent to WU by the weather station. Now that the station was set up, we can easily see this data in real-time on the LCD display which also acts as a base station and online on Weather Underground. Real-time weather data as shown on Weather Underground. It would also come handy for this data to be available in concise form via text message and over the phone so I decided to implement “poor man’s ATIS / AWOS”. For that, I utilized Weather Underground API, some Python and Plivo telephony service. Python script fetches real-time data using the WU API, caches it and process it so it works with Plivo text-to-speech API. I originally tried to use Twilio as I had experience using it in the past, but it couldn’t get it to work with a Slovenian inbound phone number. I was able to reach the phone number if I used Skype call or foreign phone number, but none of the Slovenian telephony providers were able to route phone calls to it. In addition to this data (wind, pressure, temperature / dew point) being useful to flying, we can now also observe various short and long term weather patterns and trends. If you are a bit of a weather geek like myself, that’s quite cool. Very small temperature and dew point spread? Very likely there is fog and low clouds at the airfield. Ability to view real-time weather information is useful, but it would be even better if you could also see in real-time what is going on at the airport. And that’s where the web cameras come in. In addition to allowing you to see what (if anything) is going on at the airfield, cameras are a great addition to real-time weather information when you are evaluating weather. They allow you to see real-life conditions and things such as cloud coverage, fog / mist, etc. I already had a bunch of Foscam C1 wide-angle HD cameras at home so I decided to lease / move two of them to the airfield. Since the cameras are meant to be used indoors, we installed them inside the tower to protect them from bad weather and vandalism. The picture is not crystal clear because there is a privacy foil on the glass which makes the picture look a bit darker then normal and there is also some glare from the sun depending on the sun position, but it’s good enough for now. Now that the cameras were installed, they needed to be configured to stream / send images to the internet. 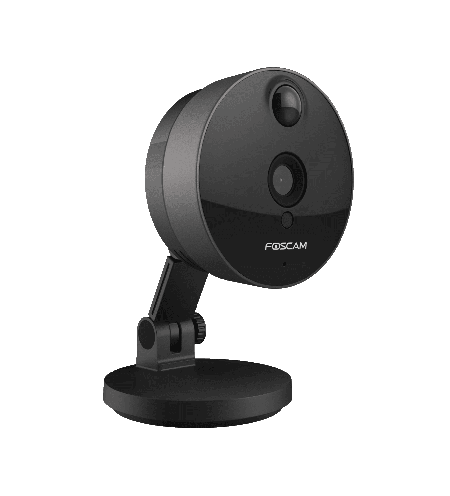 This camera and many other IP cameras allow you to connect to the camera to view stream in real-time or to periodically upload image to a FTP server. Example image from one of the cameras. It’s worth noting that this and most other IP cameras are very insecure by default and in many cases, can’t be made more secure (no SSL, many security vulnerabilities, etc.). This is not so problematic if camera is located in a public place such as is the case here, but I still decided to make it as secure as possible. The cameras are behind NAT and all the incoming connections and ports are blocked which solves part of a problem. Second part is solved by utilizing “periodically upload image” to FTP functionality. Sadly the camera only supports FTP (insecure) and not FTPS (secure) so I needed to get a bit creative. I configured the cameras to send images to an FTP server which is running inside a local network on a Rasperry Pi 3 based Linux server. 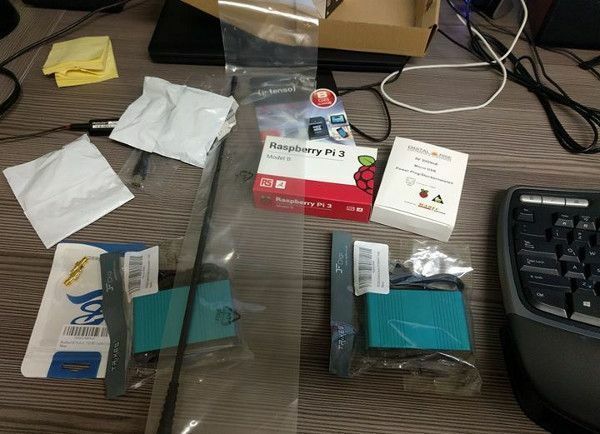 Rasperry Pi then periodically sends those images to a cloud server over FTPS. Those real-time camera images can be accessed on the website. In addition to the real-time images, you can also view time-lapse videos for the past hour on the website. Time-lapse videos are generated from raw camera images every 10 minutes for the period of now - 60 minutes. Serving the time-lapse videos presents some unique challenges. A lot of people will access the website through a phone which can’t (easily) play videos so instead of generating a video file, I decided to generate an animated .gif image. The problem with that is that animated gif is really a poor storage format for what is basically a video, so I needed to experiment a bit with ImageMagick command line options to find the combination which offers the best quality / size ratio. By default, generated .gif size was around 28-45 MB, but I managed to get it down to 5-12MB with a reasonable quality. In addition to the time-lapse videos which are generated automatically for the past hour, raw camera images can be used to generate time-lapse videos of the various interesting time frames (e.g. when a storm passes, etc.). An example of such time-lapse video can be found below. Now that the weather station and cameras were in place, the only thing missing was real-time audio feed from the airport. Nowadays it’s very easy very to set up software based radio receiver by utilizing a USB DVB-T TV tunner dongle based on the RTL2832U chipset. The chip covers a very wide frequency range (24 - 1766 MHz), but if you want good sound signal quality you need to use an antenna specifically optimized for a frequency range you want to receive. In this case, that is the airband frequency range (108 - 140 MHz). I purchased an inexpensive 30$ airband whip antenna which seems to be doing a good job of receiving transmission from the airplanes in vicinity. It’s also worth noting that VHF frequencies signal follows line of sight propagation which means the antenna itself should be mounted as high as possible and away from any obstructions. To receive the signal and stream it to the internet, I connected USB dongle to Rasperry Pi model 3, installed rtl-sdr library and RTLSDR-Airband. Some of the used equipement. 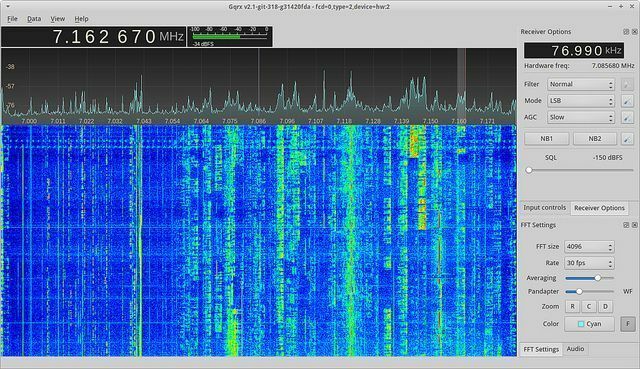 RTLSDR-Airband is an open-source Linux program optimized for AM voice channel reception and sending this data to online services such as liveatc.net. Before setting up Rasperry Pi, I connected USB dongle to my computer and used open source Gqrx SDR program which allows you to visualize received signal (strength, noise, etc.) and tweak various parameters. Gqrx is a great open-source program for software defined radio. This was an important step, because simply connecting dongle to the Rasperry Pi and setting the frequency in rtl airband config usually doesn’t yield good results out of the box. Gqrx allows you to find the optimal frequency and other settings (gain, squelch, etc.) where the signal is the strongest and audio quality is the best. If the whole thing wouldn’t work out well, I also had a backup plan. Backup plan involved using a USB sound card and connecting headphones output on the handheld airband radio / transceiver directly to the line-in on the sound card. Once I found the best settings, I plugged dongle to Rasperry Pi, configured rtl_airband settings and configured rtl_airband to stream audio to my self hosted Icecast server to test it out. After I confirmed everything was working, I contacted people at LiveATC for settings for their Icecast server so our feed would also be included on LiveATC. There were some issues because our airfield was the first one without an ICAO identifier, but they were very accommodating and in the end we managed to find a good compromise. The compromise was listing our feed under Ljubljana / LJLJ page. 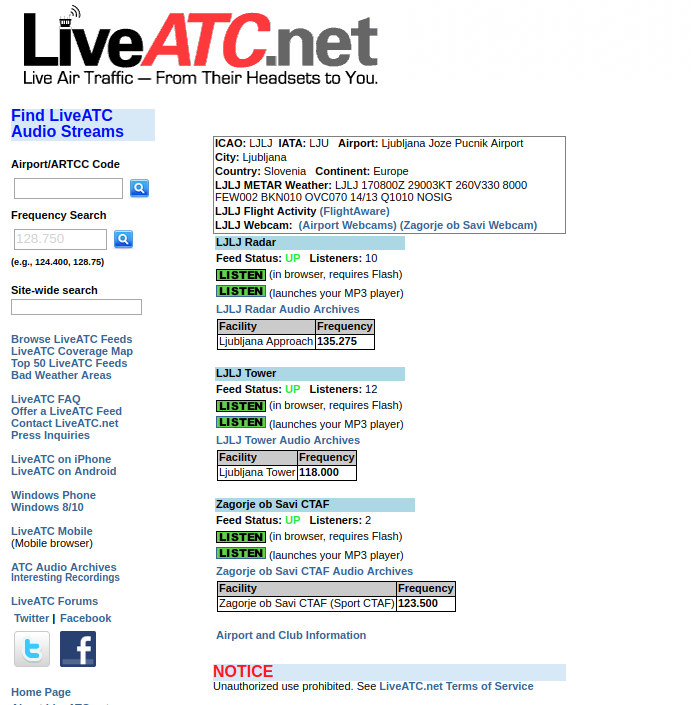 Our feed (including the archives) is available on LiveATC.net. The whole setup has been running less than a month so far and I already have some ideas for future improvements and additions. Now that we have live audio feed, the only thing missing is a life traffic feed - ability to see which airplanes are flying in the area. There are already services such as flightradar24 out there which allow you to track aircraft movements in real time, but mostly, they only track commercial traffic via ADS-B (they also cover some GA traffic, but because of their receiver locations, they only cover airplanes flying at higher altitudes). ADS-B provides the most information, but it’s not widely used here in Slovenia (yet). Mode C and Mode S transponders are more common here. Mode C is not all that useful because it only provides altitude, but Mode S also provides other data. Both of those approaches use the same frequency (1090 MHz) so it’s possible to receive those signals using the same RTL-SDLR USB dongle which is used to receive audio signal for LiveATC feed. So in theory, all it takes is a USB RTL-SDLR dongle plugged to Rasperry Pi, antenna optimized for this frequency range and some software on Rasperry Pi which interacts with RTL-SDLR and processes the received signal. In fact, there are already some projects such as PilotAware out there so we might be able to utilize existing software and won’t need to write our own. All the devices are connected to the electrical network and haven’t had any power outage yet, but outages can happen so it would be good to be able to connect all the devices to a UPS. Luckily, all the devices consume very little power so it should be possible to make a simple UPS a USB power bank which supports pass through charging and has a capacity of at least 15.000 mAh. In addition to that, other costs include 10$/month for a cloud server and 17$/month for a 4G data plan. I have recently pushed support for OpenStack Identity API v3 to Libcloud trunk. In this blog post I’m going to have a look at the motivation for that, changes which were involved and show some examples of how you can utilize those changes and newly available features. What is OpenStack Keystone / Identity service? OpenStack Keystone is an OpenStack project that provides identity and authentication related features to OpenStack projects such as Nova. The project started as a simple service which only provided basic authentication features, but it has since grown into a fully fledged and powerful identity management service. The latest version supports advanced user management, multiple projects, complex ACLs and more. 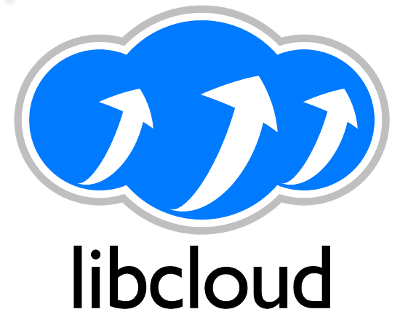 Future release will also include a Keystone to Keystone federation feature which will makes things such as a seamless cross-cloud authorizations possible. Support for OpenStack Nova was first added to Libcloud back in 2011. First version only included support for a simple token based authentication. Since then a lot has changed and new (and more flexible) OpenStack Keystone versions have been released. We have been pretty good at following those changes and support for authenticating against Keystone API v2.0 has been available in Libcloud for a long time. Those changes worked fine, but the problem was that not much thinking went into them and support for multiple Keystone versions was added after the fact. This means that the code was hacky, inflexible, hard to re-use and extend. Luckily, those things were (mostly) hidden from the end user who just wanted to connect to the OpenStack installation. They only became apparent if you wanted to talk directly to the Keystone service or do anything more complex with it. For one of the features we are working on at DivvyCloud, we needed support authenticating and talking to OpenStack Keystone API v3. Since Libcloud didn’t include support for this version yet, I decide to go ahead and add it. All of the “hackiness” of the existing code also became very apparent when I wanted to add support for API v3. Because of that, I have decided to spend more time on it, do it “the right way” and refactor the existing code to make it more re-usable, extensible and maintainable. Before my changes, all of the logic for talking to Keystone, handling of the token expiration, re-authentication, etc. was contained in a single class (OpenStackAuthConnection). To authenticate, there was one method per Keystone API version (authenticate_1_0, authenticate_1_1, authenticate_2_0_with_apikey, authenticate_2_0_with_password). This means there was a lot of duplicated code, the code was hard to extend, etc. Some other notable changes are described bellow. All of the identity related code has been moved from libcloud.common.openstack to a new libcloud.common.openstack_identity module. This module reduces coupling between general OpenStack and Identity related code and makes code re-use and other things easier. Before my changes, parsed service catalog entries were stored in an unstructured dictionary on the OpenStackServiceCatalog class. To make things even worse, the structure and the contents of the dictionary differed based on the Keystone API version. Dynamic nature of Python can be a huge asset and can make development and prototyping faster and easier. The problem is that when it’s abused / overused it makes code hard to use, maintain and reason about. Sadly, that’s pretty common in the Python world and many times, people tend to over-use dictionaries and base their APIs around passing around unstructured dictionaries. I refactored the code to store service catalog entries in a structured format (a list of OpenStackServiceCatalogEntry and OpenStackServiceCatalogEntryEndpoint objects). Now only the code which parses service catalog responses needs to know about the response structure. The user itself doesn’t need to know anything about the internal structure and the code for retrieving entries from the service catalog is API version agnostic. In addition to the changes mentioned above, OpenStackIdentity_3_0_Connection class now also contains methods for performing different administrative related tasks such as user, role, domain and project management. This section includes some examples which show how to use the newly available functionality. For more information, please refer to the docstrings in the openstack_identity module. This example shows how to authenticate against Keystone API v3 using the OpenStack compute driver (for the time being, default auth version used by the compute driver is 2.0). This example show how to obtain a token which is scoped to a domain and not to a project / tenant which is a default. Keep in mind that most of the OpenStack services don’t yet support tokens which are scoped to a domain, so such tokens are of a limited use right now. This example shows how to talk directly to OpenStack Keystone API v3 and perform administrative tasks such as listing users and roles. If you only use OpenStack compute driver, those changes are fully backward compatible and you aren’t affected. If you use OpenStackAuthConnection class to talk directly to the Keystone installation, you need to update your code to either use the new OpenStackIdentityConnection class or a version specific class since OpenStackAuthConnection class has been removed. 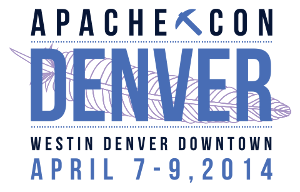 This is just a quick heads up that I will be attending ApacheCon North America, 2014 in Denver, Colorado next month. I will be giving two talks. First one is titled 5 years of Libcloud. This is retrospective talk where I will tell a story of how Libcloud grew from a small project originally developed for the needs of Cloudkick product into a fully fledged and relatively popular Apache project. I will go into details on some of the challenges we faced, what we learned from them and how we grew the community and the project. Second one is titled Reducing barriers to contribution to an Apache project. To give you some context, I first need to say that I’m a person who loves to move fast and loves lean and efficient approaches and teams. On top of that, I also have zero tolerance for unnecessary / useless processes and deep and mostly useless hierarchies. All of that means I don’t see myself a big company person, where having useless processes, which among many other things, slow innovation down is usually the norm. Apache is a relatively big organization which means it has it’s own fair share of (useless) proceses. A lot of “new era” developers who grew up with Github also consider Apache as slow, inflexible and place where projects go to die1. In this talk I will go into details why this is not totally true and how Apache is (slowly) becoming more flexible and changing to adopt those new work-flows. On top of that, I will also give some examples on how you can adopt those new work-flows, iterate fast and still receive all the benefits from being an Apache project. Those examples will be taken directly from the things we have learned at the Apache Libcloud project. Depending on how many people will attend the talk, I think it would also be very interesting to turn this into a panel where other people can contribute their ideas and we can discuss how to reduce barriers even further and make Apache more attractive for “new-era projects”. Besides my talks, Sebastien Goasguen, a long time contributor to the project who has recently joined the PMC is also giving a talk titled Apache Libcloud. If you are around, you should stop by to listen to those talks and contribute your ideas to my second talk. This is call for participation / proposals for all the students who are interested in working on Apache Libcloud project during the Google Summer of Code 2014 program. Before diving further, I just want to give a short disclaimer. We (Apache Software Foundation and Libcloud as a project) haven’t been accepted into Google Summer of Code 2014 yet, but we will apply, cross our fingers and hope we get a spot. We will know if we have been accepted on February 24th when Google publishes a list of the accepted mentoring organizations. Google Summer of Code is a program where Google sponsors students from around the world to spend their summer working on open-source projects. Student is paid 5500$ if they successfully complete all of their evaluations. More information about the program can be found on the project website. This year is also special, because it’s a tenth anniversary of the program. To celebrate the anniversary, Google is, among other things, giving out 5500$ for successfully completed projects instead of the usual 5000$. Apache Software Foundation is not a stranger to Google Summer of Code since it has already participated in this program multiple times over the past years. We (as in Libcloud project) have also participated in GSoC 2014 with one project. I have mentored a student Ilgiz Islamgulov from Russia who has worked and successfully completed (yeah, software is never really done, but in this case completed refers to him passing all the GSoC evaluations) a project called Libcloud REST interface. Why should I participate / What do I get out of participating in GSoC? Before looking at our call for proposals, let’s have a look at why you might want to participate in Google Summer of Code program. It’s a great thing for your C.V. You will be able to show potential employers some concrete things you have worked on. This is the part where you, dear students come in. We would like to invite all the students who are interested in participating to start thinking about the things they could work on and start reaching out to the community. It doesn’t matter if you are already using or contributing to the project or not, everyone is welcome (people who have or are already contributing to the project have a slight advantage though since we already know what they are capable of)! Only pre-requisite is a good knowledge of Python, HTTP, REST APIs and a basic familiarity with different cloud services such as Amazon EC2 and others. As noted in the opening paragraph, we haven’t been accepted yet and the student applications will open in about a month. The reason I’m already posting this is because we want to give potential candidates plenty of time to get familiar with the project and the community. If you would like to participate, now is the right time to start exploring the existing ideas (you are also more than welcome to propose your own ideas), start thinking about the things you could work, getting familiar with the code base and start reaching out to the community. I’m happy to announce that a new Libcloud website is now live at libcloud.apache.org. Design and layout wise, previous website hasn’t really changed since 2009 so a makeover was long overdue. The new website includes many new features and improvements. One of the more important ones is a new and fully responsive design which means that the content can now also more easily be consumed on devices with smaller resolutions such as mobile phones and tablets. On top of that the new website is now powered by Jekyll (same as my blog) which makes adding content and many other things easier. Without further ado, I encourage you to go check out the new website and read the announcement blog post. For older posts, visit the Archive page.